We all know the Verizon commercial with the guy asking repeatedly, “Can you hear me now?” demonstrating coverage. Although art is not about selling phones, the notion of being heard/seen/experienced is very important to an artist. We want to know that our message is being received. I want to make it clear that I’m not making a differentiation between “working artist” and those who create for fun, release, and joy. It doesn’t matter if your work is hanging on a refrigerator or the Metropolitan Museum of Art. Creativity is not hierarchical; it’s universal! One of the important aspects of living a full life is the opportunity to tell our stories. Our stories punctuate key moments in our lives that are the foundation for who we’ve become. Our stories are memorable and make impressions on those around us. Our stories have impact the lives of others, sometimes without our knowledge. Using our creativity to “amplify” our lives gives us a broader platform to share what’s important to us. Amplification is important because too many times our stories get drowned out from all the “noise” of society. We all want to be seen and heard and creativity is one way to make that happen. It’s a way for us to remain true to ourselves and that’s the key to living a genuine and authentic life. If you’re looking to embark on a healing journey, amplifying your story is key to blazing your own unique trail! There was a time in our history when the “tape recorder” was a common electronic component in our lives. I had a small colorful one made by Panasonic. I used it for many things from recording music off the radio, recording the second part on a duet so I could play a duet without another person, or listening to something over and over to memorize it. Times have changed and we’ve gone digital. Our phones have recording capabilities not to mention a host of apps on our computers such as Garage Band. During an interview I heard this past weekend I heard an artist say, “We are a constant tape recorder for our lives.” When we invoke the creative muses in our lives we can capture the memories, feelings, and experiences providing us with healing energy. These captured moments remind us how we overcome adversity, celebrate accomplishments, and soothe ourselves during times of stress. Our creativity is the tape recorder of the soul. Using creative outlets, whether you create something unique, put your own twist on it, or simply enjoy experiencing something beautiful it has meaning to you. It represents something in your life you want to remember. It signifies a part of your life worth noting, like a landmark when you’re driving and looking for a specific destination. These creative landmarks create shortcuts to the feelings you experienced in the past and allows you to access the feelings you need for health and healing. I can’t think of anything more poetic than the song Memory by Barbara Streisand. The line, “Memories, light the corners of my mind.” Creativity allows us to shine a light on poignant moments that teach us lessons and allow us to create a lessons learned approach to life. Give yourself the gift of creative expression and indulge yourself in the bounty that will come from recording life’s experiences! Art is beautiful. It conveys emotions, ideas, and philosophies. Art unlocks our unconscious processes giving us greater insight to our own psyche and a peak to the collective consciousness. The unfortunate thing is that too many people feel that art is out of their reach. They have come to believe that art is something only created by people whose work shows up in galleries, museums, and the pages of magazines. Is art really inaccessible? I was invited over to one of my neighbors last week for a get together. On one of the walls were about eight drawings, all framed, and created by their daughter. The work was hung as proudly as any work of art bought in a gallery. It was not only a testament to their pride of their daughter’s creativity, but acknowledged the importance of her persona in the home. A study done in an arts magazine a couple of years asked students starting in kindergarten about how they perceived themselves in relation to art. The youngest participants when asked if they felt they were artists answered yes unanimously. When the researchers asked fourth graders (about 9 years old) about sixty percent felt they were artists. By the time the researchers got to the high school students, only about 2 students in the class felt they were artists; what changed their self-perceptions? Dave Burns, a sculptor, was interviewed on the PBS series Arts District. Burns said, “You don’t have to be an artist, you just have to start.” I believe what Burns was saying is that you don’t have to be a professional artist because we’re all artists in our own way and not expressing ourselves is the real shame. Art heals! Art allows us to be true to ourselves making us more authentic in all aspects of our lives. Allow your inner artist to peak through and grow over time and watch the changes that will take place in your life! We often think about seeing art in a museum, gallery, or studio space. The truth is that art is everywhere. You can find original art in restaurants, hair salons, and hospitals. Culturally we’re beginning to see art become a part of our collective consciousness because it impacts our physical, emotional, and spiritual lives. I recently had the experience to work in the NY/NJ area and found myself in New York City f or a couple of sightseeing opportunities. 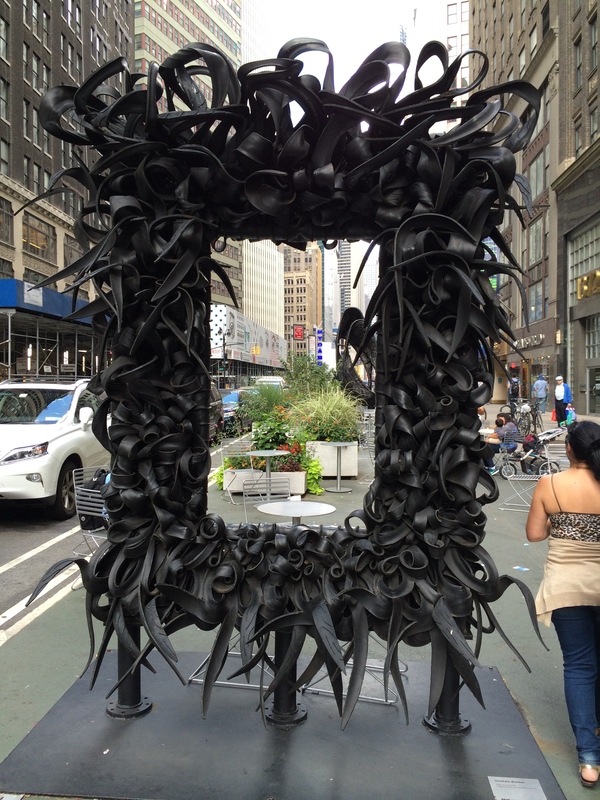 I saw these few large black structures in the street. As I got closer I realized these weren’t structures, but art pieces. Upon closer examination I saw these pieces were made of rubber. 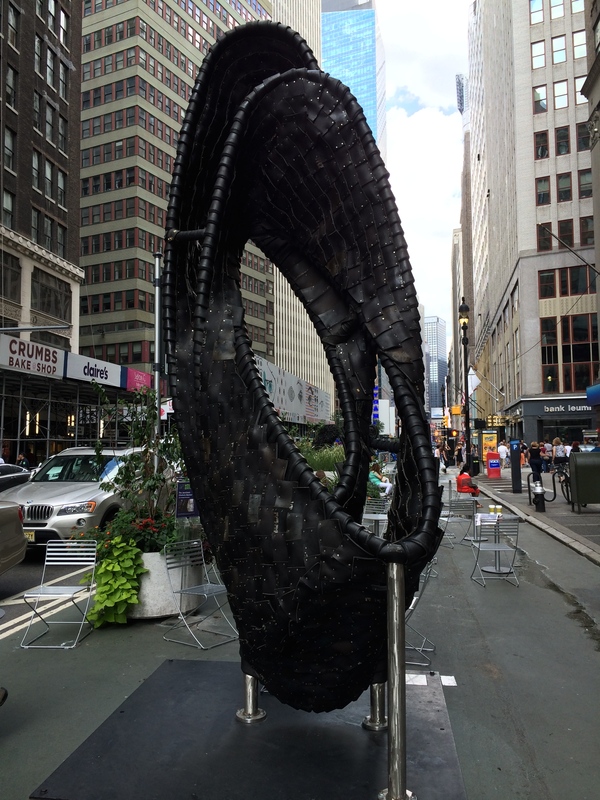 I believe they are recycled tires that have been transformed into something beautiful. It’s that shift from functional to something beautiful. Even a tire can have a second life and that’s what art does for us; it gives us a new life! The furniture world is jumping on the bandwagon with complete lines of furniture with “reclaimed” wood. People who are building or remodeling homes are looking for “reclaimed” lumber. There are even art exhibitions where the theme is “recycled” materials. This punctuates the idea that everything old can be new again! We’ve told throughout the ages that one person’s trash is another’s treasure. Art allows us to create, invent, repurpose, and make beautiful anything and everything we come in contact with. When we create we give meaning to the materials we use. We utilize these materials to tell our story and then share that story with the world. Look for art wherever you go. Make art out of “unconventional” materials. Change the idea of something being “unconventional” to being innovative. Expand your create palette by taking it to the streets or other places where you can tell your story! If You Meet Your Inner Artist on the Road…. What if you met your inner artist on your journey? Would you recognize him or her? Would you be attracted to him or her? What is it that you would like to ask your inner artist? Fortunately you do get to meet your inner artist, each and every time you create! When you create you are reintroduced to parts of yourself that may have been in hiding. You may reconnect with special experiences, moving moments, or provocative questions. Your ability to greet these aspects of yourself provides you with motivation, inspiration, and the desire to share your story. Symbols, part of the creative process, are parts of our inner tickle file bringing us back to those recurring themes. How will you nurture your inner artist? Many working artists look for patrons of the arts to help support them as they strive to continue their pursuit of creating art. You are patron for your inner artist. Whenever you feel inspired you feed your inner artist. When you ask a question you feed your inner artist. Your story is all your inner artist needs to fulfill its destiny. Are you willing to meet your inner artist for a blind date? Many of us don’t believe we’re creative and unfortunately there is no online dating service to link you up with your inner artist. It’s important to provide a safe space for your inner artist to bloom. He or she is patient. Your inner artist is compassionate and will give you the space you need until you’re ready to express yourself through visual arts, writing, dancing, or music to name a few. When you notice what you’re attracted to you are getting acquainted with your inner artist. Stop for a moment when you feel your body sway to the music. Stop for a moment when you begin humming a favorite tune. Stop for a moment when you notice magnificent architecture or tagging on the wall of a building. Those moments are little whispers from your inner artist asking you to pay attention. Take your inner artist on a date and begin telling your story in new and creative ways!